25 November 2018 marks the International Day for the Elimination of Violence against Women. 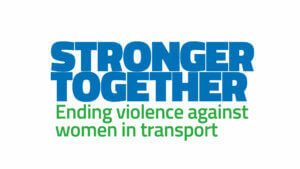 On this occasion, the ETF has launched the campaign Stronger Together Ending violence against women in transport. The aim of the campaign is to raise awareness on gender-based violence in transport, and help social partners conclude better policies addressing the issue at company level. The target group are social partners at company and sector level, in all transport sectors. The campaign builds on the findings of the ETF survey on gender-based workplace violence in transport which revealed alarming incidents of violence against women transport workers by colleagues, managers and customers. More than 1400 women transport workers from across Europe shared their experience of workplace violence and harassment. One in four said it is a regular occurrence in the transport sector. This is not acceptable. Violence should never be ‘part of the job’ and has no place in the transport industry. Every women transport workers has the right to a safe and fair workplace. You will find more information and the campaign materials on the campaign webpage.